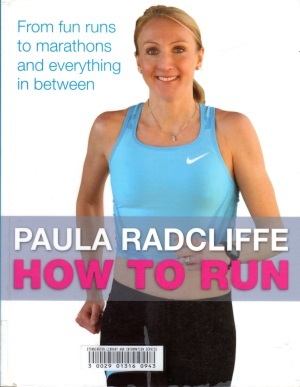 As the cover says, this 2011 book covers the beginning runner attempting 5 kilometres all the way through to very serious marathoners. All aspects of running are covered from mental preparation, equipment, injuries, exercises and training schedules. It is not a step by step journal of a great running career although there are anecdotes to illustrate points being made. It is the kind of book that can be used as a reference and be dipped into frequently as the runner progresses. There are sets of training schedules for 5k, 10k, half marathon and full marathon aspirants. One difference from many published schedules is that weight training is an integral component. In fact, the fast marathon schedule has up to three gym sessions per week. She also emphasises the need for rest days. The last chapter “Focus on Women” covers the changes required during and after pregnancy. Radcliffe competed at a very high level after the birth of her first child so writes from experience. Recommended, whether the runner is male or female. Review copy from Stonnington Library.